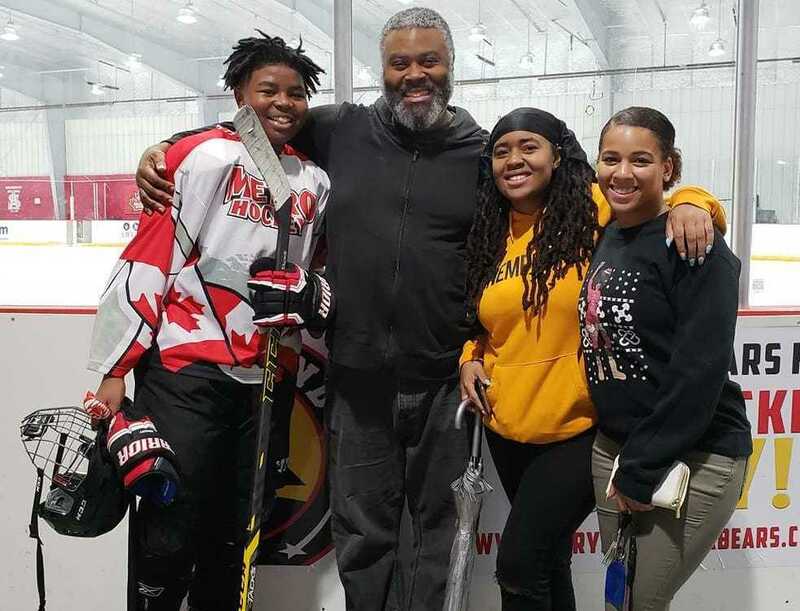 Team Rallies Around Black Hockey Player After He Receives Racist Taunts At a recent ice hockey tournament, 13-year-old Divyne Apollon II was subjected to racist abuse from the opposing team. Angered by the lack of action from others, his teammates came to his defense. Divyne Apollon II with his father, Divyne Apollon Sr., and his sisters, Deja and Devinity. Divyne, 13, plays defense for the Metro Maple Leafs based in Odenton, Md. Divyne Apollon II, a 13-year-old African-American hockey player, was playing in a recent tournament in Maryland when the opposing team hurled racist insults. While Divyne and his father — who was at the tournament — have seen this behavior at rinks before, they were both stunned when his teammates came to his defense. "It made me feel appreciated, like I actually was supposed to be there, and that somebody that wasn't just my dad or my family members actually cared," Divyne tells NPR's Noel King. Divyne, who has been playing hockey for five years, says he has experienced racist taunts on the ice multiple times. However, it has never been as extreme as this past tournament, where the other team called him the N-word and chanted for him to get off the ice and go play basketball. "The game Saturday was buzzing with racial animosity. The monkey sounds were constant when the players were in Divyne's zone. And he tried to ignore them. "He kept looking at the other coach, the refs. They did nothing. Maybe they couldn't hear. But his teammates heard, and they were furious. The game got rough. "At the end of the third period, the fed-up teammates started yelling at the other team and a fight began. Divyne said he got punched in the face, and he fought back." The subsequent brawl caused Divyne, who plays defense for the Odenton., Md., Metro Maple Leafs, to be ejected from the game. "I knew when he fell in love with hockey that this would be part of the experience, unfortunately," his father, Divyne Apollon Sr., tells King. He says his advice to his son was to focus on playing hockey. "You don't deal with the refs; you don't deal with the coaches — that's my department," he says. "I transfer that also into police, teachers, adults. That's not your realm to deal with, that's for me to deal with." Divyne says he usually does brush off the jeers. "I realized if I was to retaliate or hit the kid or something, I'd end up getting penalized again, so I just brushed it off." That is, until his teammates stood up for him and he defended himself in the uproar that followed. The parents of Divyne's teammates had no idea that he — and his father — had been increasingly experiencing similar racist sentiments at games for the past few years. "I've had people ignore me at other rinks who work there, they will brush me off, and you kind of know the telltale signs that 'OK, we aren't wanted here,' and you kind of keep moving on and find other ways to deal with things so it doesn't get to a point where I'm the 'angry black guy,' " Apollon says. Divyne had a different take on the surprise of the other parents. "I just thought it was funny because they didn't know it was something that happens, even though it happens to me pretty often," he says. Divyne's experience has sparked professional hockey players to voice encouragement. Moved by the support of Divyne's teammates, two players from the Washington Capitals invited the Metro Maple Leafs to an NHL game on Jan. 14. And P.K. Subban, a high-profile black NHL player, has been similarly driven to respond to young black hockey players who have recently faced racism on the ice. Subban and his father have encouraged them to keep playing hockey, according to the Washington Post. Despite the recent events, Divyne doesn't want to give up the sport. "I enjoy it too much and put too much time and effort into it to give up on it," he says. Emma Talkoff and William Jones produced and edited this story for broadcast.